This deal is good from now until Mothers' Day (May 12th), so if you're looking for a tablet that won't break the bank (for you or mom! ), this one's hard to pass up. Head to the source link to buy. NEW YORK--(BUSINESS WIRE)--NOOK Media LLC, a subsidiary of Barnes & Noble, Inc. (NYSE: BKS), the leading retailer of content, digital media and educational products, today announced its best prices ever for the acclaimed NOOK HD and NOOK HD+ in celebration of Mother’s Day and the recent addition of the popular Google Play digital content experience on the lightweight 7- and 9-inch high definition tablets. Through Mother’s Day, May 12, NOOK HD is available at the amazing price of $149 (8GB) and $179 (16GB), and NOOK HD+ is offered at the spectacular value of $179 (16GB) and $209 (32GB) at Barnes & Noble bookstores and on NOOK.com. NOOK HD and NOOK HD+ are also available through other leading retailers. On Friday, the company announced it was expanding its extensive catalog of reading and entertainment with Google Play on NOOK HD and NOOK HD+. Now customers can enjoy the best in reading and entertainment with access to one of the world’s largest digital reading content catalogs, with more than 700,000 Android apps and games, millions of songs, thousands of movies and TV shows, plus popular Google services like the Chrome™ browser, Gmail™, YouTube™, Google Search™ and Google Maps™. More than 700,000 Android Apps and Games: Choose from more than 700,000 great apps all ready to enjoy right away. The NOOK Store™ continues to feature a wide selection of thousands of high-quality NOOK Apps™ tailored for the devices. Millions of songs: The addition of Google Play Music lets customers browse millions of songs, discover new artists and fill NOOK HD and NOOK HD+ with favorite tracks to enjoy anytime. Favorite Movies & TV Shows: Choose from thousands of movies and TV shows, including new releases, the latest episodes, award-winning films and past seasons from favorite TV series. Stream movies and TV shows to watch instantly on NOOK HD and NOOK HD+ or make them available offline to watch later, even when not connected to Wi-Fi. The Very Best in Reading: The NOOK Store offers more than 3 million books, including more than 1 million free titles, as well as thousands of magazines and newspapers in spectacular HD each available for a 14-day free trial. Browse favorite catalogs like never before. Fast Web Browsing: Enjoy fast start up and page loading and an unlimited number of tabs open at once with the new Chrome browser. Great Google Services: Customers will have instant access to Google Search, Gmail, YouTube and Google Maps, now built in to NOOK HD or NOOK HD+. Sync calendars across multiple devices and check email from any account including Exchange, Yahoo! and Hotmail. Stunning HD Displays: Crisp text and beautiful graphics make books and magazines stunning to read and movies a joy to watch. Light and Portable: Weighing in at only 11.1 ounces and 18.2 ounces respectively, NOOK HD and NOOK HD+ are light and easy to hold for hours of enjoyment. NOOK Profiles™: A personalized experience instantly transforms the device in hand to any family member’s very own tablet so only they can see their own content. NOOK Channels™: This pioneering recommendation system provides an easy way to discover new titles by theme. The ability to sync the last page read on any NOOK Book across NOOK devices and apps so customers don’t lose their place. 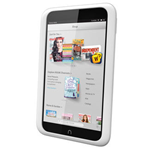 Expandable memory on the devices and free unlimited NOOK Cloud™ storage for all NOOK content. Powerful dual-core processors and built-in Wi-Fi and Bluetooth. Google Play and the other Google services are available to all new and existing NOOK HD and NOOK HD+ customers at no cost through an automatic over-the-air update currently underway. More information on the major new software update is available at www.NOOK.com/support. For more information on NOOK HD and NOOK HD+, or any of NOOK’s innovative products and devices, customers can visit www.nook.com or www.nook.co.uk.